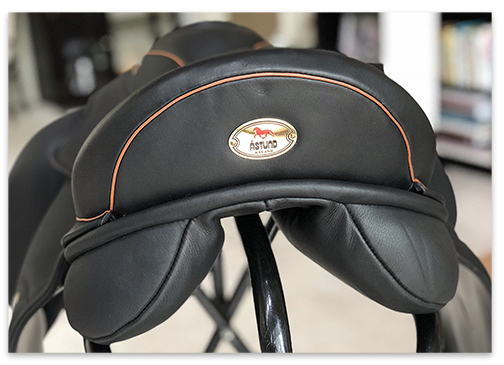 May, 2018 - Sand Meadow Farm is now and official dealer of Ástund Tack! We carry the popular Xenophon and Wakanda saddles – as well as the whole line of Ástund tack and equipment. Please contact us for more information. March, 2018 - The Standard Blood Profile Project is Completed! For the past four years, Andrea has worked tirelessly in orchestrating the USIHC's project with Cornell University to create a standard blood profile for the Icelandic breed. The project was a complete success, and the scientists identified several blood test values where Icelandic horses tend to differ from other breeds. Currently, a summary of the results of the project is available in the March 2018 issue of the USIHC's Icelandic Horse Quarterly magazine. This article should be provided to all veterinarians that treat Icelandic horses. In addition, in the future the scientist hope to publish a more technical academic article in an open source publication. 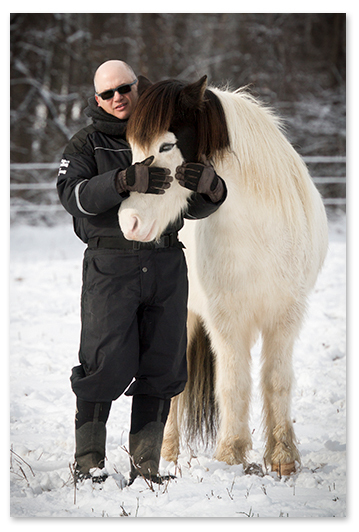 This will be helpful to Icelandic horse owners and treating veterinarians around the world. We'd like to thank all the generous project participants and donors that made this important project possible. No doubt the results will be a significant help to the health and well-being of our beloved horses. Braving the dreariness and mud of late winter, we enjoyed a nice visit from Andres Pétur Rúnarsson, Owner and Managing Director, Fákasel in Iceland and Hlynur Gudjonsson, Consul General and Trade Commissioner of Iceland. It was a nice chance to talk about the exporting of horses from Iceland to the US - and the American market for Icelandic horses in general. As you can see in the photo, Bokki and Kleópatra were happy to act as the official farm welcoming committee. December, 2017 – New Horses From Iceland Have Arrived! Steve giving some love to new import Sleipnir frá Markaskarði. Sleipnir has already found a new home in Georgia. After a long painful wait for a flight five new horses finally arrived from Iceland. Several have already found new owners. But others may be available. They are all settling in well and enjoying the winter weather. We are so happy to have them join the Sand Meadow herd. Check back often for updates about them. 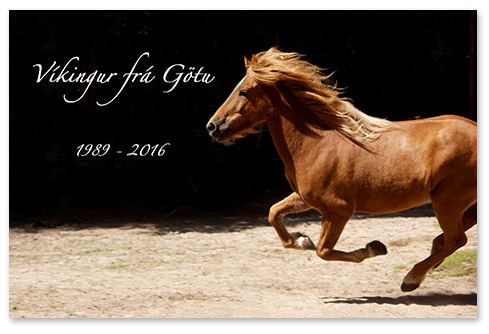 We are devastated to announce the loss of one of the original founders of Sand Meadow Farm - Víkingur frá Götu. In fact Víkingur was with us before there was even a Sand Meadow Farm. One of the reasons we bought a farm was to ensure that Víkingur would never have to leave us when it was time for him to retire - and he never did. For about 18 years Víkingur was our friend and teacher. He was an incredibly intelligent horse with a deep, sensitive soul. One of the very special ones. Sand Meadow Farm just won't be the same without him. Mendon Ponds Park lies only about five miles from Sand Meadow Farm. This beautiful county park is listed on the National Registry of Natural Landmarks for its many unique natural features. The diverse terrain at the park makes for incredible rides and during the riding season you can find Sand Meadow horses tolting down the park trails several days a week. So when we heard that the rules had suddenly been changed for allowing horses in the park we were quick to rally the support of the local equestrian community to protect the rights of riders in our beloved park. Thankfully, the rule changes proved to be a simple mistake and the original rules were quickly reinstated – so a happy ending for all. But the swift and passionate response from the equine community did not go unnoticed. In fact, the Daily Messenger printed a story about the issue, along with the above photo, on its cover. To read the full story CLICK HERE. 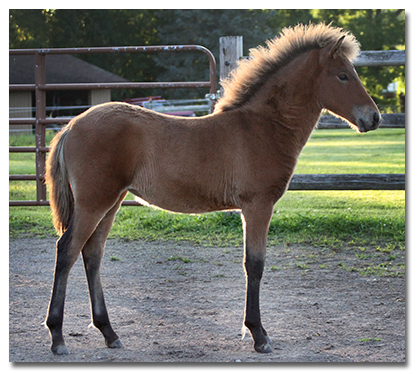 January, 2016 - Sand Meadow Breeding Producing the Next Generation of Quality Icelandic Horses! Look for great things from these well-bred young horses in the future! June, 2015 – Blær’s evaluation scores are in! We are very proud of our 2008 colt, Blær from Sand Meadow (S: Stígandi frá Leysingjastöðum II, D: Birna frá Akureyri), both as a riding horse and as a sire. Blær was fully evaluated at the recent Vernon, BC evaluations receiving a 2nd prize overall, scoring 8.08 for conformation, 7.55 for riding, and 7.76 total. Of note was his supple, well-raised, long neck, correct limbs and strong joints, long strides, supple tolt, and willing and cooperative character. Blær also had three offspring shown for conformation, two receiving first prize scores and the other receiving a high second prize. In addition, one of his granddaughters (out of Roðadís from Sand Meadow) greatly impressed the judges during the Young Horse Evaluation. We are thrilled to see a Sand Meadow bred horse having such a great impact on breeding quality Icelandic horses in North America. Congratulations to Blær’s trainer/rider Hanna Dilts and owner Lisi Ohm! 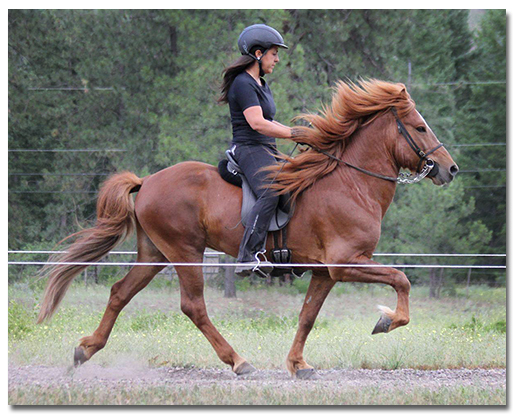 July, 2014 – Venus Receives An Excellent Young Horse Evaluation! In conjunction with our Pleasure Riding Clinic, FEIF International Breeding Judge Barbara Frische was at Sand Meadow Farm to judge young horses. Unfortunately we were unlucky and had pouring rain for much of the day so no outside horses were able to come to the event. But we were still able to have one young Sand Meadow horse judged - Venus sired by first prize Hergill frá Oddhóli out of first prize Sædís frá Melabergi - who was born earlier this year. Barbara found Venus to be a very high-quality four gaited filly. In particular Venus received high marks for her long neck, cylindrical and light build, correct legs, hoof quality, reactions, and high neck carriage. She has good suppleness and beat in all her gaits and has the ability for high leg action. For conformation she scored 82.56%, for character 89.5%, and for gaits 70.56% - overall 77.97% - an excellent result for a four gaited horse. We are very excited to watch this filly develop as she has her mothers sweet and bright personality paired with her sire’s beautiful movements. We couldn’t ask for more. May, 2014 – Good Results from the Kentucky Evaluations! 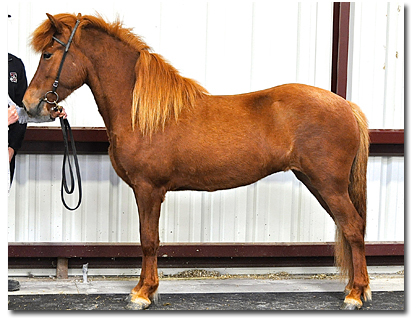 We received some excellent results from the breeding evaluations held at Swallowland Farm in Shelbyville, KY. Our new mare, Lögg frá Laufhóli, was evaluated for conformation only as she has just started her training. She scored over first prize with a total of 8.03. The judges’ comments noted her beautiful head, slim, well-raised neck, high withers, good proportions, well-separated tendons, and thick hornmaterial. This result just further confirms our feeling that Lögg is quite a beautiful mare. In addition, Kalman’s offspring, Rauðhetta from Full Quiver Farm, scored first prize for conformation at only four years old. The judges’ appreciated this beautiful young mare’s finely chiseled and attractive head, well-raised and supple neck, broad back, good proportions, well-separated tendons, and thick hornmaterial. Another conformation success from Kalman! We look forward to hearing more good updates about this special mare in the future! January, 2014 – Loftsteinn is the #1 highest evaluated young horse of 2013 – with other Sand Meadow youngsters not far behind! 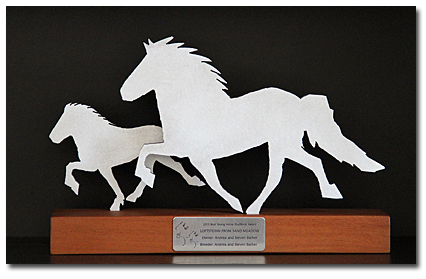 Based on the results of all the young horse evaluations performed by FEIF International Breeding Judge Barbara Frische in 2013 (approximately 60 horses), Loftsteinn from Sand Meadow was the highest evaluated young horse of the year – and winner of The Studbook's annual award for that honor. Barbara found him to be a “very good horse” with a “lot of tolt”, “brave, fun to go, and proud” with “good spirit”. But our good news didn’t stop there - Kleópatra was #2, Sokkadís was #5, Þoka was #9, and Magni #15. All in all an incredible showing for Sand Meadow Farm bred horses! We are thrilled to have all the time and effort we have put into our breeding program publically validated in this way. We couldn’t be more proud. November, 2013 - Sand Meadow Horses Score Well in Young Horse Evaluations! FEIF International Breeding Judge Barbara Frische visited Sand Meadow on November 3rd to officially evaluate our young horses. We are very proud to report that all five of our young horses scored above average. Barbara had a lot of praise for our breeding program and we were thrilled to have such a well-respected judge appreciate our efforts. Barbara also enjoyed riding several of our breeding horses. In particularly she had lots of fun on Kalman, who she described as a “Harley Davidson” - full of power and fun. Individual results from each of the young horses’ evaluations can be found up on their respective pages. February, 2013 – Sand Meadow Farm is featured in the 2013 StudBook! We are proud to be one of the featured breeding farms "making an impact in North America" profiled in The Icelandic Studbook – Icelandic Stallions of North America. In the article you can read a bit about our breeding philosophy, farm history, etc. And of course you’ll find both Kalman and Hergill listed in the StudBook’s stallion listings. Don’t subscribe to the Studbook? You can order the online by clicking here. May, 2012 – Blær evaluated first prize for conformation! Our 2008 colt, Blær from Sand Meadow (S: Stígandi frá Leysingjastöðum II, D: Birna frá Akureyri), was evaluated for conformation at the FEIF International Evaluations in Vernon, BC. He scored over first prize with a total score of 8.08, including 8.5 for proportions (well proportioned, long legs) and 9.0 for quality of legs (strong joints, strong tendons, dry tendons). This is an excellent result especially considering that Blær is only four years old! In addition several of his offspring were evaluated at a young horse evaluation at the same event and were very well received. 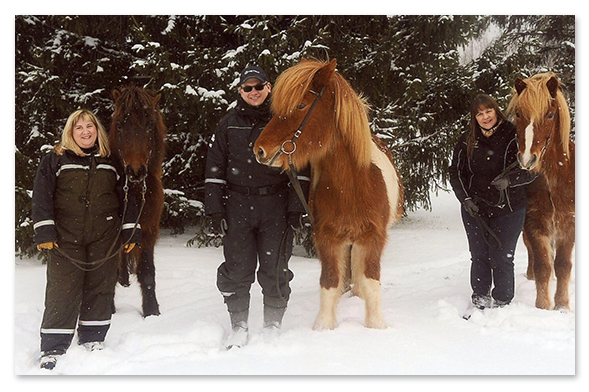 Congratulations to owner Lisi Ohm of Vindsdalur Icelandic Horse Farm in Falkland, BC! The Saint Skutla Icelandic Horse Club is featured in current issue of Country Folks Mane Stream, with Steve and Kalman on the cover! To view the entire issue CLICK HERE. Enjoy! Sand Meadow Farm is featured in the New York State Horse Council, Western Chapter Fall Newsletter. To read the full article click here. April, 2010 - Want to see Icelandics in action? Then check out Sand Meadow Farm’s channel on YouTube! We have several videos up already and will be continuing to add more. We have a huge amount of video shot over the years so we just have to edit it and get it up. Check back for updates or sign up as a subscriber.